On April 4, 1968, Dr. Martin Luther King, Jr. was assassinated on the balcony of the Lorraine Motel. This week, BILL MOYERS JOURNAL observes the anniversary of King's murder by examining America in light of his dream. What would he think of our country today and where would he focus his fight against inequality and injustice? 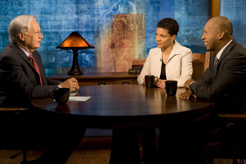 Two talented lawyers who've dedicated their careers to fighting inequality, Michelle Alexander and Bryan Stevenson, join Bill Moyers on the JOURNAL to examine justice and injustice in America 42 years after King's death. Alexander believes that King would be deeply troubled by the remaining inequality in America. As she tells Bill Moyers, "I think Martin Luther King would be thrilled by some of the individual progress of African Americans, but stunned, absolutely stunned and saddened, by the state of African Americans as a whole today." Stevenson adds that to reach King's dream, America must address the causes of poverty, "I think in America, the opposite of poverty is justice. I think there are structures and systems that have created poverty, and have made that poverty so permanent, that until we think in a more just way about how to deal with poverty in this country, we're never gonna make the progress that Dr. King envisioned." Both believe that America's policies of mass incarceration continue the cycle of poverty. America is the largest jailer on the planet, with 2.3 million people behind bars. But the policy of mass imprisonment, unique among industrialized nations, disproportianatetly affects minorities, especially African American men. One in 100 adults in America is behind bars, but one in nine African American men aged 20 to 34 is behind bars. Much of this arises from the "war on drugs." According to Human Rights Watch, African American adults have been arrested at a rate 2.8 to 5.5 times higher than white adults in every year from 1980 to 2007. Yet, according to government statistics, African Americans and whites have similar rates of illicit drug use and dealing. Today in communities of color across America, large majorities of African American men have been branded criminals, felons for life. And as a result, many are denied the right to vote, automatically excluded from juries, and legally discriminated against in employment, housing, access to public education-- public benefits. Many of the forms of discrimination we thought we left behind in the Jim Crow Era are legal again, once you've been branded a criminal. We didn't have to incarcerate people for 10, 20, 30, 40 years for simple possession of marijuana, for drug use. We didn't have to do that. We made choices around that. And now the consequences are devastating. I think they're not only devastating from a political perspective, but  I think this is the way I think it relates to Jim Crow, as well  it's also been devastating within communities of color. Right now, for black men in the United States, there's a 32 percent chance you're going to jail or prison. In poor communities and minority communities, urban communities, rural communities, it could be 60 percent or 70 percent. You're born, you're a ten-year-old kid. There's a 70 percent chance that you're going to go to jail and prison. What does that do to you? Bryan Stevenson has been representing capital defendants and death row prisoners in the deep south since 1985 when he was a staff attorney with the Southern Center for Human Rights in Atlanta, Georgia. Since 1989, he has been executive director of the Equal Justice Initiative (EJI), a private, nonprofit law organization he founded that focuses on social justice and human rights in the context of criminal justice reform in the United States. EJI litigates on behalf of condemned prisoners, juvenile offenders, people wrongly convicted or charged, poor people denied effective representation and others whose trials are marked by racial bias or prosecutorial misconduct. Stevenson's work has won him national acclaim. In 1995, he was awarded the prestigious MacArthur Fellowship Award Prize. He is also a 1989 recipient of the Reebok Human Rights Award, the 1991 ACLU National Medal of Liberty, and in 1996, he was named the Public Interest Lawyer of the Year by the National Association of Public Interest Lawyers. In 2000, Stevenson received the Olaf Palme Prize in Stockholm, Sweden for international human rights and in 2004, he received the Award for Courageous Advocacy from the American College of Trial Lawyers and the Lawyer for the People Award from the National Lawyers Guild. In 2006, NYU presented Mr. Stevenson with its Distinguished Teaching Award. He has also received honorary degrees from several universities, including Yale University, the University of Pennsylvania, and Georgetown University School of Law. Stevenson has served as a visiting professor of law at the University of Michigan School of Law. He has also published several widely disseminated manuals on capital litigation and written extensively on criminal justice, capital punishment and civil rights issues. A 1985 graduate of Harvard, with both a masters in Public Policy from the Kennedy School of Government and a J.D. from the School of Law, Stevenson joined the clinical faculty at New York University School of Law in 1998. Michelle Alexander is the author of THE NEW JIM CROW: MASS INCARCERATION IN THE AGE OF COLORBLINDNESS. She currently holds a joint appointment with Ohio State's Moritz College of Law and Kirwan Institute for the Study of Race and Ethnicity where she teaches courses regarding race, civil rights and criminal justice. Her current research agenda focuses on the development of alternative rhetorical, legal, and theoretical frameworks for addressing racial inequity, particularly in our criminal justice system. Alexander has litigated civil rights cases both in private practice and at the ACLU of Northern California. As director of the ACLU's Racial Justice Project, Alexander directed a special project aimed at moving a racial justice agenda through litigation, media, grassroots organizing and legislative advocacy. The Project's priorities were eliminating racial bias in the criminal justice system and achieving educational equity in California public schools. She launched a major campaign against racial profiling in California known as the "DWB Campaign." Litigation included three major class actions: Rodriguez v. California Highway Patrol (challenging the California Highway Patrol's discriminatory drug interdiction program); Casteneda v. UC Regents (challenging UC Berkeley's racially discriminatory admissions process); Williams v. State of California (challenging California's failure to provide basic minimum necessities for an adequate education to poor and minority students). Alexander is a graduate of Stanford Law School, and has taught clinical courses at Stanford Law School and Boalt Hall School Of Law, University Of California, Berkeley. From 1993 to 1994 she served as a clerk for Justice Harry A. Blackmun, United States Supreme Court. Founded by Bryan Stevenson, the Equal Justice Initiative is a private, nonprofit organization that provides legal representation to indigent defendants and prisoners who have been denied fair and just treatment in the legal system. By Bryan Stevenson, May 20, 2006. "The New Jim Crow "
By Michelle Alexander, TOMDISPATCH.COM, March 8, 2010. Michelle Alexander's faculty page at the Moritz College of Law. Articles by Michelle Alexander are collected here. Kirwin Institute for the Study of Race and Ethnicity. Sentencing Law and Policy Blog. Law professor Douglas Berman maintains a blog tracking issues related to sentencing law and policy. In the months before his death, Dr. Martin Luther King Jr. had expanded his focus on racial justice to include reducing economic inequality. On this week's 42nd anniversary of King's assassination, Bill Moyers sits down with attorneys Bryan Stevenson and Michelle Alexander to discuss how far we've really come as a country, how poor and working class Americans have been falling behind and what America must do to fulfill Dr. King's vision. Revisit Dr. King's evolving theories of social and economic justice through his speeches. Plus, a Bill Moyers essay. The U.S. has five percent of the world's population and 25 percent of the world's prisoners -- how did we get here? Another study, THE SPIRIT LEVEL by Richard Wilkinson and Kate Pickett, shows that the US has the greatest income inequality among the major developed countries. Get the stats and read an interview with the authors.